I consider myself something of a TV bad boy connoisseur. Your Dylan McKays. Your Pacey Whitters. Your Logan Echolls. Your Sawyers. And here’s what I know about TV bad boys. When they are good, they are very, very good (sigh) but when they are bad, they are laughable and bring a whole show down. Granted, moody, sullen Jake (Tom Sturridge) isn’t the only problem with Sweetbitter. But he’s emblematic of the show’s central problem—it’s tediously boring, lacking flavor, seasoning or spice. 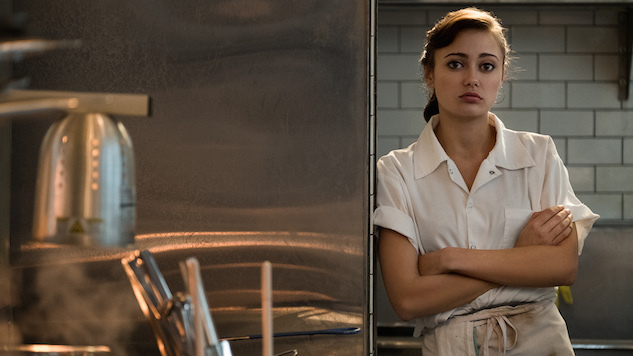 Based on the novel of the same name by Stephanie Danler, the six-episode series follows Tess (Ella Purnell), a 22-year-old who comes to New York City in search of a more interesting life and lands a job at one of the city’s most esteemed restaurant. As in the book, Tess is a passive character. Things happen to her. She observes more than she engages. She’s living the show’s tagline “life happens while you wait.” That kind of central character simply plays better on the page, where Tess’ lifeless approach to her life doesn’t make you want to shake her out of her stupor. The series is faithful to the book. But the truth is, not a lot happens in the book and its popularity was more based on how Danier brought the senses Tess encounters at the restaurant to life. Here Tess walks around mumbling, “Sweet, sour, salt, bitter.” It just doesn’t have the same effect. Tess’ co-workers become her family (dinner for the staff is even called family dinner). There’s stoic manager Howard (Paul Sparks), back waiter Ari (Eden Epstein)—who supplies Tess with drugs and nicknames her “baby monster”—nice guy Will (Evan Jonigkeit)—who is assigned to train Tess—and Simone (Caitlin FitzGerald), a glamourous server who knows wine as well as she knows her customers. Simone also has a mysterious connection with Jake, the restaurant’s bartender, which I think is supposed to be interesting. But this is a series so boring that the press materials list Tess trying oysters for the first time as a spoiler. Simone is prone to bon mots like “the things that come easy to us are not what define us” and “some men like to pretend they are dangerous and damaged, but some men actually are.” If there’s a highlight to the series, it’s FitzGerald, who brings an elusive elegance mixed with a tinge of sadness to the role. The entire show wallows in the passive voice. In the sixth episode, we learn about a secret Simone has been carrying (a spoiler more significant than the oyster one, but not by much), but it’s revealed in the most uninteresting way possible. Seeing the hustle and bustle of the nightly dinner crowd and all that goes on to bring the perfect meal paired with the perfect wine to the table will make you appreciate everything more the next time you go out to dinner. Which I recommend doing instead of watching Sweetbitter.